Safe to say I outdid myself from the last post and got myself some liquid gold Nike Air Max. Best £125 I’ve ever spent. They go for £500 on eBay now WTF! Still I love them too much to ever let them go. This blog was created mainly because I wanted to get into the fashion industry. Where I got a taste through interning at GQ magazine and did get an offer for buying experience at a retail brand. I was probably going to be looking at a few years on zero wage (if that) – having a mortgage and living in London makes this an impossible dream. Unless I worked 2 jobs and had no social life, which definitely isn’t an option. Hence why I now work in finance! Luckily enough though it was while I was interning at GQ that I managed to luckily get my hands on these. They were the last pair in my size in the gold (rather than silver). I ummed and ahhed for a while as I wasn’t getting paid and would have to use my savings. My feet were soaked so it was just meant to be. “The unicorn designer is the most in demand and rarest of product team members — someone with excellent interaction design skills, visual design skills, and coding ability”. Unobtainium. I sadly threw away my monochrome Air Max 90 trainers I’ve had since I was 14. And how well they lasted! We’ve grown up together threw school to university. Sweeeet. Anyway, out with the old and in with the new! I love the Air Max style and how they have just been revamped over time. On my trainer wish list are these two styles of Air Max 1. They are so pretty! If I had to choose between the 2 I would go for the Navy ones, purely because they are more wintery colours. Ahhhh they would be my Christmas party dancing shoes! Nat is going to New York at the end of the month so I’ve been racking my brains trying to come up with a shopping list for her from me! Top of the list is a new watch. I decided I really liked the Kenneth Cole Skeleton watch and even though Kenneth Cole is from New Yoiiirk I don’t think I’ll be getting Nat to buy me a watch for the sake of a £5 saving. I still don’t know if Kenneth Cole is the one…as I’d like to have a look in some London boutiques to see if I find a similar watch but in brown leather with a more vintage feel. I’ll make sure I find it just in time for Christmas! What do you think of the watches? Before the Summer I was eating well and doing lots of exercise to get my dream body and also to just generally take care of myself. Once the Summer arrived with various trips abroad and general life taking over I slipped back into old habits. Soon enough the cellulite started to reappear on my thighs, and I started to feel sluggish in the afternoons, and just generally blurgh. So last week I decided to get back on track with my healthier lifestyle, and the first thing I did was start a food diary again. When I keep a food diary it helps me see what exactly I ate and drank that week, identify any patterns, and anywhere I can improve my choice of food or subsitute with a healthier option. What I’ve found from last week is that I’m still going for food high in sugar, although as I was keeping a diary I went for more natural fruit options rather than refined sugars. I also ate quite a lot of chocolate, and looking at the times I ate it was when I was bored! So this week, I’m aiming for more lean protein and less sugary foods. I’ve also added something new to my diet, chia seeds. These little seeds may be teeny tiny, but they are so full of good stuff I thought they’d be worth a try. You can get them in whole seed form or milled. They’re so small they do get stuck in your teeth, so when the bag I have runs out I may buy the milled version. I add a table spoon to my muesli pot in the mornings or to soup or smoothies. I also went back to circuit training for the first time in ages last week. I got a bit too carried away though and fell flat on my face during the sprinting! Luckily everyone else had run off ahead of me so they didn’t see me eat the grass! Photos are taken from our instagram. Follow us! 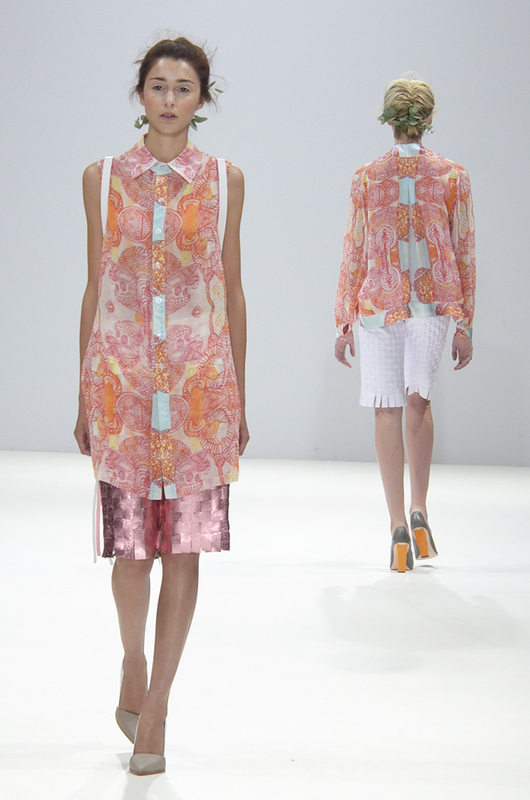 I had an absolute blast assisting Fashion Scout’s blog at this year’s London Fashion Week SS14. Fashion Scout are a platform for emerging designers where they hold many awards such as ‘Ones to Watch’ and ‘Merit Award’ for those they believe will be huge names in the future. I met some really cool people and I have to say the blog is looking amazing…check it out! 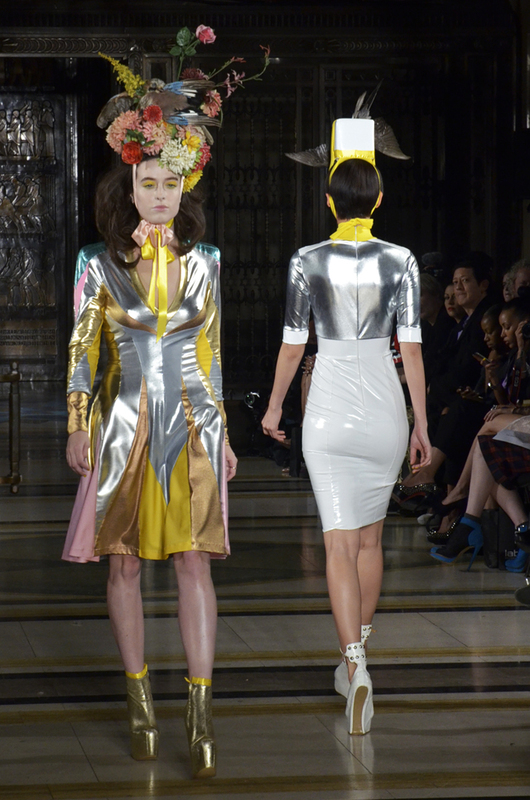 Highlights for me have to be the Tabernacle Twins, LULU LIU and Pam Hogg. 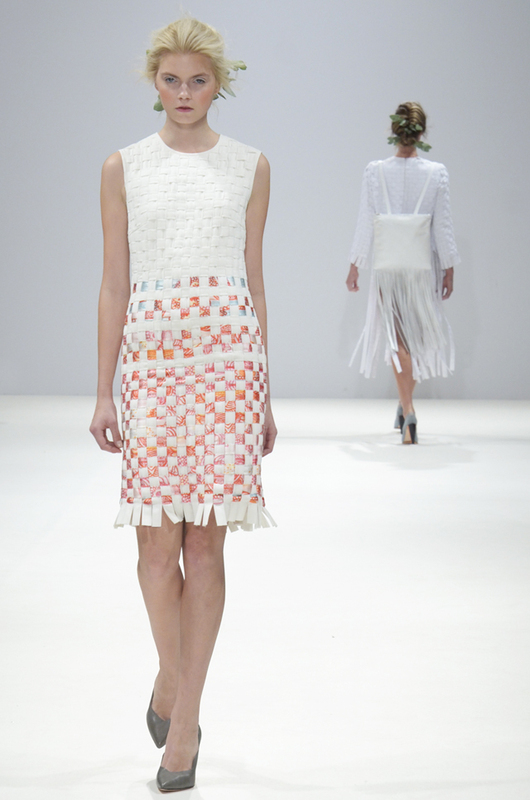 Vibe Lundemark’s label is quirky and playful transporting you to a fantasy land. This is an approach which he bases on the adventures of the fictional ‘twins’. The collection is ready to wear and street style inspired with the psychedelic bomber jackets and jumpsuits covered in cobras. The white combined with sharp purples gave off a really strong edgy look topped off by the Dr. Martens. I could definitely see myself wearing the jumpsuits to a festival…nice and comfortable..not practical for toilet breaks though! 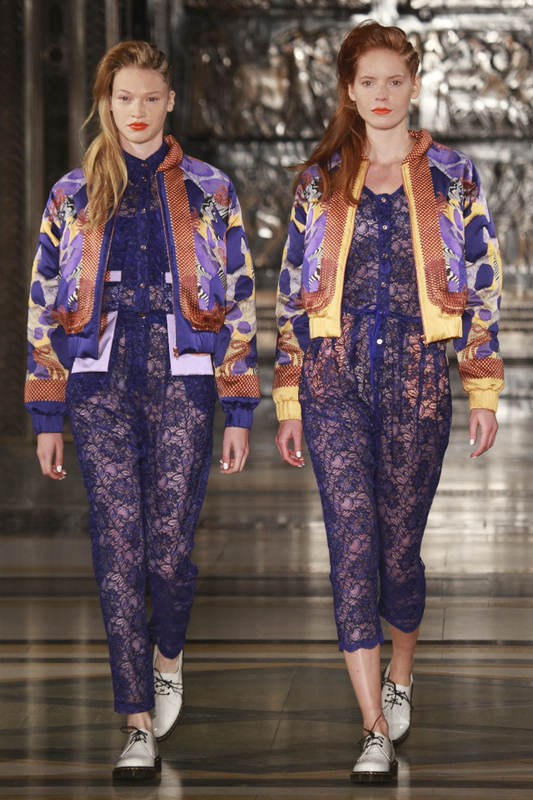 Head to toe lace is demonstrated here as a key trend for SS14. Again taking inspiration from fantasy worlds, Lulu Liu took her inspiration from ‘Yarrow Wando’ a dragonfish conjured up in her own imagination. 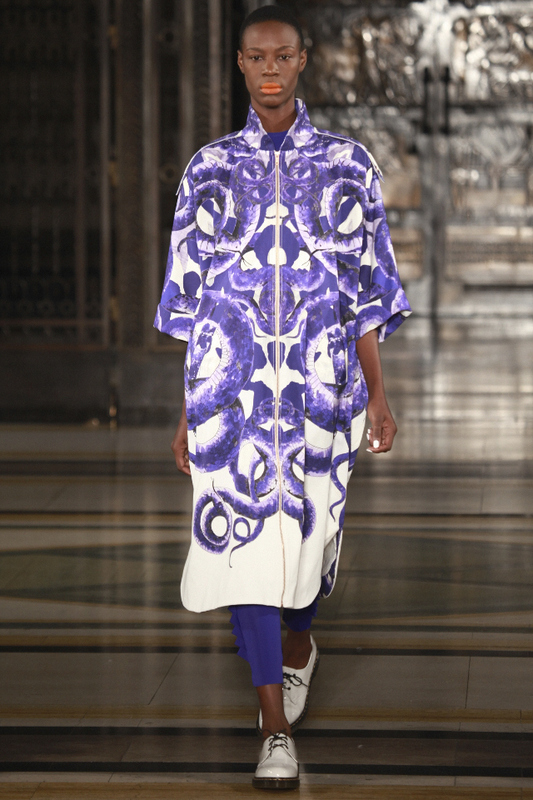 The Japanese influence is evident in her printed pieces using a colour palette of coral, turquoise and fusia to name a few. The pieces were wearable and along with the make up, fresh and natural. The arms of this last piece does look like it could be part of a fish! I love the volume in her garments, which is signature to her designs. Metallic leather in greens, silver and pink were also seen as a strong component of the designs and accessories. Still on trend for SS14. 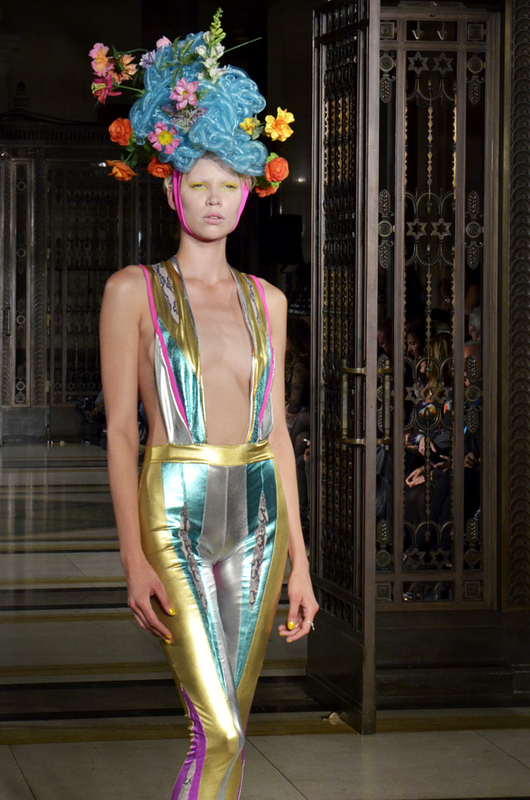 Pam Hogg’s ‘Future Past: War and Peace: Past Future’ collection was reflected by the mixture of military inspired uniform ranging from two piece suits and sexualised jumpsuits. This was contrasted by flowing skirts and bright coloured jumpsuits in PVC, adorned with floral and feathered head pieces. 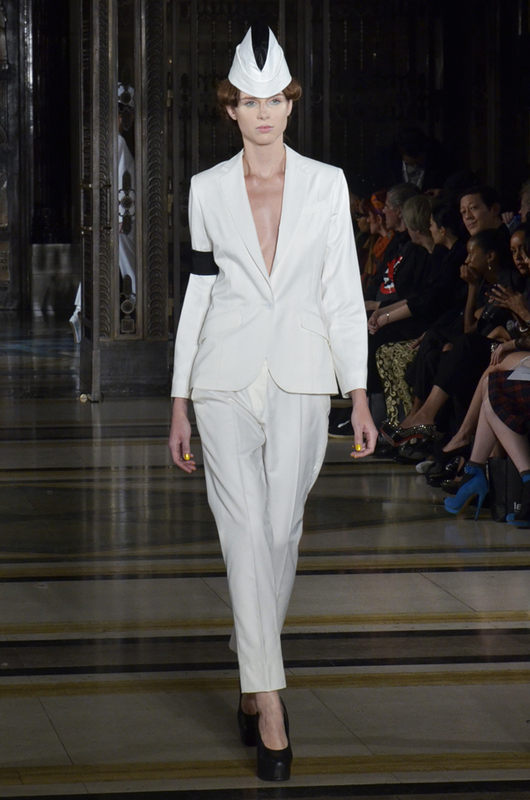 This show, as expected generated a huge buzz and astounded reactions from viewers, to quote DJ Gemma Cairney’s tweet “I don’t even know how to explain how wonderful that show was.” It is clear to see why Pam Hogg has dressed so many rock stars such as Blondie and Siouxsie Sioux as her signature PVC jumpsuits are spectacular. 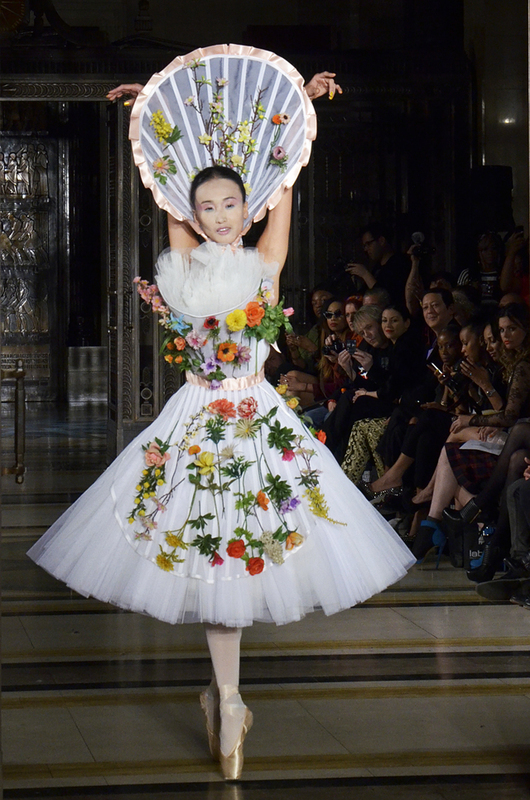 Florals are yet again evident for SS14 however life sized flowers stitched onto the garments giving a 3D appearance. Ecaille, meaning tortoiseshell, is a softer version of Ombre, which has been the colour style du jour in recent seasons. The beauty of ecaille is that it works on all hair colours and can be adapted to give the best match for your skin tone. For brunettes, the process marries two different depths of lights with chocolate shadows and for the warmer skin tones; Ecaille matt with ash tones gives the look a slightly cooler edge. I can’t wait to get an appointment booked in to get this done! What about you? I’ll also be making sure I update my hair products to keep my hair nourished after the new colour and during the winter by investing in key colour products like the Jo Hansford Intensive Masque (RRP £27,00, 150ml) or Illuminoil (RRP £29,00, 50ml). This weekend the 5th Brazilian Film Festival will be held at the Odeon Covent Garden, with a selection of feature films and short films being shown, and there will also be a selection of the best in South American cuisine on offer from some of London’s top South American food spots. So if you love Brazilian food and culture or you’re curious to get to know a bit more why not head down? A short film seeking to understand the phenomenon of “forbidden funk” it’s origin and sucess through the life of MC Smith. Summer is apparently on its last legs so I decided to choose the items in my wardrobe that will soon be going into storage. I bought this H&M crochet style camisole top at the start of the season and it is such a handy staple! The length means that I can wear it to work with high waisted bottoms as my midriff isn’t hanging out, and the detailing of the crochet layer is great for smartening up an outfit. Following on from my previous posts about How to take care of curly hair, and How to style curly hair, thought I’d do one last post with inspiration of different curly hair styles. I’ve got that Friday feeling…so it’s time for a little dance with Flying Lotus…Do The Astral Plane!